Specify required parameters in the Edit Parameters dialog box that appears when executing a query. 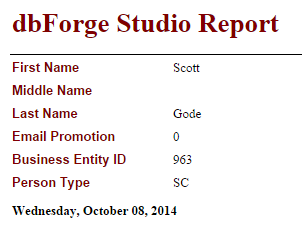 (Alternatively, you can specify parameters in an already created Data Report). Make a report with the help of the Data Report Wizard. Let’s observe this process in a real example where we ought to filter employees by their ID numbers in the employees’ database and find the exact one, with ID number 963. 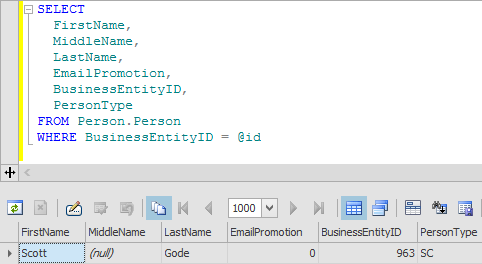 Here is the script of the executed query with the created @id parameter that is equal to 963. If the process is successfully completed, an output folder of a result file is displayed. Thus, specifying parameters through the command line saves your time, you get the same results quickly and automatically, without typing any code. To learn more about additional command-line arguments supported in dbForge Studio for SQL Server, refer to the documentation of dbForge Studio for SQL Server. To learn how to specify parameters via the Data Report Wizard, read the Report Parameters article.